This week my elder child turns twelve years old. She has requested for a rainbow cake for her birthday. I was not very keen to bake this cake initially as it is quite tedious and time consuming. You see, each layer of the coloured batter has to be baked seperately. My oven has the capacity for baking two six inches layers at one go but I find the baking uneven thus prefers to bake each layer one at a time. Another reason which holds me back is this cake uses many food colourings. Eventually I relented as I thought it would be very meaningful as my girl will be taking her PSLE examinations soon and I would like her to do well and pass with flying colours! This cake is so colourful! It won't hurt much since it is not consumed that often. Another intention is I hope to motivate her to work hard for her coming exams and be a good role model for her as mummy takes up this tedious task. The day before her birthday, she was going back to school during the one week September school holiday for her supplementary lesson. I thought it would be nice for her to celebrate her birthday in advance with her classmates. I used the same rainbow cake recipe to make the rainbow cupcakes for her to bring to school and all her friends love this colourful rainbow cuppies and commented that it is too pretty to be eaten! 3. Beat in egg white a little at a time, ensuring it's well mixed. 4. Mix in vanilla extract. 5. Add 1/3 of the sifted flour and baking powder and mix well. 6. Add 1/3 of milk. Mix well. 7. Repeat step 5 and 6 until all well incorporated. 8. Divide the batter into 6 equal portions. 9. Add Wilton gel colouring to the 6 divided portions. cupcake tin, spread it evenly out with the teaspoon. Put it into the preheated oven and baked for 1.5 minutes before taking it out and spreading 1.5 teaspoon of the blue batter on the slightly baked purple batter. Put it back into the oven and baked for another 1.5 minutes. Remove from the oven and repeat the steps for green, yellow, orange and red batter. 11. When all the six colours are filled, continue baking in the oven for 15-20 minutes or until a skewer comes out clean. 7. Repeat step and 6 until all well incorporated. 8. Divide into 6 equal portions. 11. Cool all cake layers on a wire rack completely before assembly. Use an electric mixer , beat cream cheese and icing sugar till well mixed. 1. Beat the whipping cream in a cold metal bowl with sugar till firm and stiff. 2. Add in custard powder and mix well. 1. After the baked cake layers are completely cooled, fill each layer generously with the cream cheese icing starting with Violet layer at the bottom, followed by Blue, Green, Yellow, Orange and lastly Red layer at the top. 2. After all the 6 layers are assembled, crumb coat the whole cake with the remaining cream cheese. Put into the fridge while you prepare the outer frosting. 3. Decorate the cake as desired. 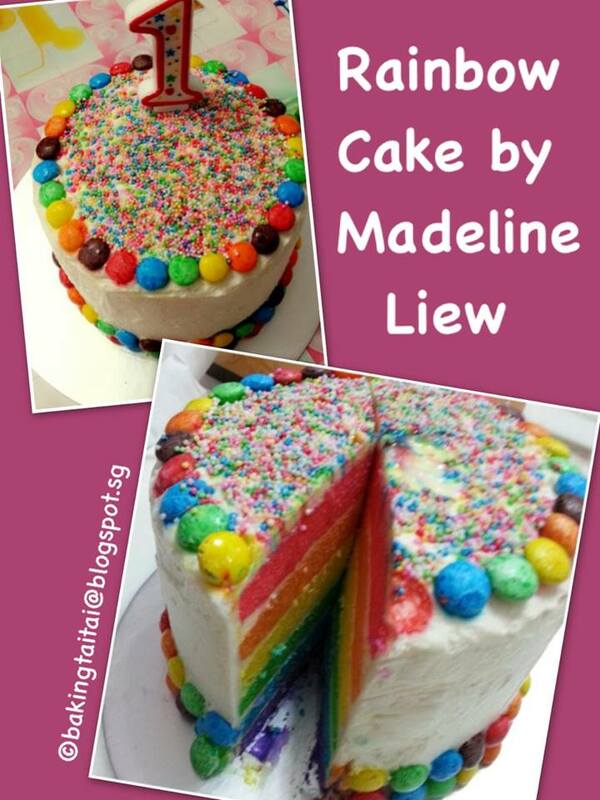 Madeline Liew says," I made this for my daughter's 1st birthday. My frosting is still far from perfect but thanks for all the tips given!"